Dispute resolution is one important area for Quantity Surveyors. They advice clients regarding construction disputes and moreover they may practice as Adjudicators, Mediators and Arbitrators. Nevertheless, he also in a risk to subject to disputes with his employers and Clients. Hence it is important to know the applicable law for QS's working in Qatar in relation to labour dispute resolution. Aim of this article is to discuss the labour dispute resolution mechanisms available in the Laws. As I discuss in “Dispute resolution mechanism”, there are several types of Dispute resolution mechanisms available in the world such as Negotiation, Mediation, Conciliation, Mini trial, Arbitration and Litigation. In the Law has adopted following Dispute resolution mechanisms for labour disputes resolution. According to the Article 129 any disputes between employer and workers shall try to settle by themselves. Article 129 states, in case of a dispute between employer and workers, if there is a joint committee in the company, they can be referred the case to the committee. Joint committee hasn’t address in the Law in detail; however this would be similar to the Mini Trial approach. If above two mechanisms failed then the next step is Medication. According to the article 129, workers shall submit complaint in writing to employer with a copy to the labour department and the employer shall reply in written to the worker within one week, with a copy to the department. If the reply does not resolve the dispute department will try to settle it through Mediation within 15 days. “1. The workers shall submit their complaint or claim in writing to the employer with a copy thereof to the Department. 2. The employer shall reply in writing to the complaint or claim of the workers within a week from his receiving the same and shall send a copy of the reply to the Department. If they fail to bring both parties in to a common ground within 15 days, then the department should submit the dispute to a Conciliation committee. According to the article 130, the Conciliation committee shall comprise 3 members. One shall nominate by the employer and other by the workers. Chairman of the committee shall be appointed by the Minister. The committee have authority to get assistant of a specialized consultant to make a decision. The committee shall give its decision within a week and it shall be binding on the all parties, if they had agreed to refer the dispute to the committee. “The committee may be assisted by consultation with any of the specialists before deciding on the dispute and shall issue its decision on the dispute within a week from the date of its submission thereto. If parties have agreed to refer the dispute to arbitration, the above conciliation step is not applicable and the dispute will directly refers to an arbitration procedure. According to the article 131, the Arbitration committee shall be formed under the presidency of a Judge. One member is a representative of the workers and others, a representative of Qatar Chamber of Commerce and a representative of the Ministry. According to the article 132, the committee shall render final awards on majority basis. However in case of equality of votes the chairman of the committee shall have a casting vote. Committee can review documents and conducts hearing before they make the award. Until the dispute settle, both parties shall continue their duties and responsibilities. It has clearly mentioned in article 133. It is a good movement, that Qatar has totally depends on Alternative Dispute Resolution methods rather than traditional litigation with regarding labour disputes. There is no information regarding the cost of dispute resolution in the act. Mr.Bhathiya practised as a Quantity Surveyor in Qatar for ALEC Contracting Limited. He got an accident and admitted to the hospital. He discharged from the hospital and return back to home after 2 weeks from the accident. He has informed to the ALEC, that he is still not well and needs another additional 2 weeks for rest as sick leave since already he finished his all sick leaves. However ALEC has rejected his request and asked him to report to the office. Mr.Bhathiya also refuses the company’s request. Finally the contract was terminated by the company. After the termination, other employees planned to go on strike against the termination. 1. Can Mr.Bhathiya refuse to come for work by refusing company’s request? According to the article 112 such disputes (dispute arises between the worker and the employer as to the ability of the worker to resume his work) shall refer to the competent medical authority and their decision shall be final. 2. Can employees go on strike? Yes. But under certain circumstances and subject to approval of the committees. In 2010 September, 90 labourers were arrested by the police and deported for strike against their company that violated an agreement with them2. 3. Law No (14) of the Year 2004, Doha: Qatar Labour Department. Pareto is an Italian economist, who created a mathematical formula for describe the unequal distribution of wealth in Italy. He has found 80% of the wealth of Italy has owned by 20% of people. The principle also knows as the 80/20 Rule. 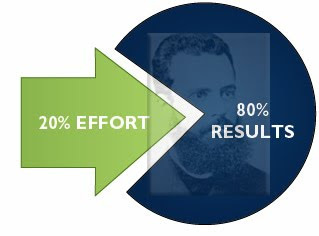 Later many other experts have observed similar phenomena to Pareto principle in their own fields. Following examples are described important of Pareto principle to various professionals/peoples. · Project managers know that 20 percent of the work consumes 80 percent of the time and resources. 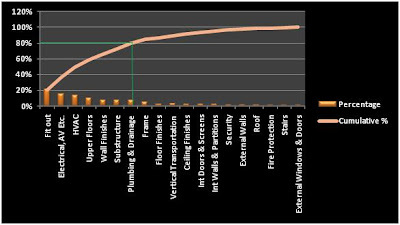 · Planning engineer knows that 80% of delays in a construction project arise from 20% of possible causes of the delays. · Marketing manager knows that 20% of his marketing efforts generate 80% of his marketing results. · Nimal knows that 80% of his expenses for 20% of items. If the Project manager plans and perfume well that 20% of works, he will have a greater success. If the Planning engineer plans well that 20% of causes, he will have a greater success. If Nimal plans well his 20% items, he may be able to save more money. 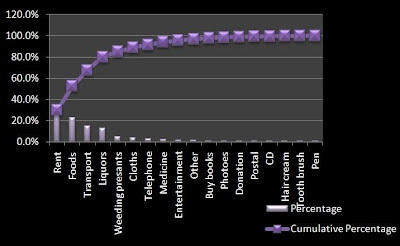 Below Pareto graph represent Nimal’s expenses. It shows 80% of Nimal’s expenses is because of 20% of items, in namely for rent, foods, transport and liquors. I have analysis the Nimal’s expenses with Pareto principle in one of my article titled “එදිනෙදා මුලය කලමණාකරණය 2(Day today financial management 2)”, that may worthwhile to read to you. You can access the article on www.kedapatha.info. It is important to note that actual percentage may differ from 80% and 20%, but the spirit of the principle will remains true for most of causes. Now, let’s move to see the applicability of Pareto principle for Quantity Surveyors. Quantity Surveyor (QS) can be adopted the Pareto principle for various Quantity Surveying functions from Inception to Completion and even after the completion also. Quantity Surveyor may establish the client budget in Option appraisal or Strategic Briefing stages*. First step of Cost planning is establishing cost targets at the Outline proposal stage. In another way, establishing cost targets is the way of distributing, established budget. In Outline proposal stage QS can establish group element cost target. Following is an example for a Group elementary cost plan at Outline proposal stage. * Figures are not realistic figures. Now let’s draw the Pareto graph for above cost plan. 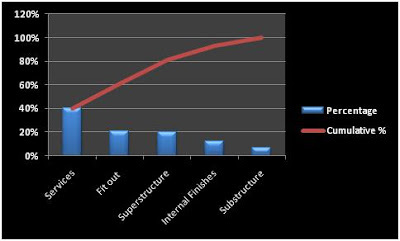 According to the Pareto graph, 80% cost of the project is representing by three group elements (60%) namely Services, Fit outs and Superstructure. In Detail design stage QS may produce an Elementary Cost plan. Following is the Elementary Cost plan for the above project at Detail design stage. According to the Pareto graph, 80% cost of the project is representing by seven elements (37%). In both Design and Pre construction phases, QS should ensure that the cost of the project should within the allocated budget, which is the main purpose of cost planning. In order to accomplish the purpose, QS have to continuously do cost checking and cost reconciliations. After reconciliation, QS may come out with a smiley faceJ, when the cost of a particular element is less that the established target in the cost plan. However in some cases cost of a particular element may exceeds the target, which is not a cause to keep QS happyL. In later case, QS have three options to overcome from terrible situation. 1) Ask client to increase the budget and change the cost target for the particular element. This option is not favour of the QS, since it may imply QS’s cost plan is erroneous. 2) Ask design team to review the design and bring it within the cost limit. 3) Share cost with some other elements which have cost saving. In second option, Quantity Surveyor should advice to design team to pay more attention for first 7 elements (37%) out of 19 elements, which are representing 80% of the total cost. Changing an element from first 37% elements make greater effect to the project cost. However design team may have to pay their attention for some other factors before review an element such as effect to other elements by changing a particular element. For an example, change the substructure design may effects to all other element and change the wall design may effects to finishes. The Institution of Civil Engineers (ICE) has identified the following sub-processes within the Value Management process. 1) Value planning - During the design and pre construction phase of a project. 2) Value engineering – During construction phase of a project. · Replace custom made high capacity (1100CFM) exhaust fan with two nr law capacity (2 ´ 550CFM) interconnected exhaust fans. The alternative did not change the function; however there is a Rs. 30,000.00 Cost savings has been made for the client. · Use isolated chillers sets instant of central chillier unit. This has made a Rs. 500,000.00 cost saving to the client which is 10% of the item cost. 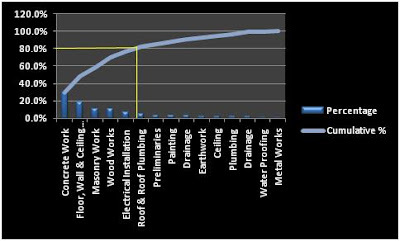 Following Pareto graph has been drawn for a residential building during Tender documentation stage from the tender estimate. According to the Pareto graph, 77% cost of the project is representing by five elements (33%), from Concrete Work to Electrical Installation. Hence VM team should focus on those first five elements instant of others to get an effective VM result. Since the Quantity Surveyor as the cost consultant, plays proactive role within the VM team to achieve successful outcome. * RIBA plan of work. 3. Kelly, J., Male, S. & Graham, D., (2004). Value Management of Construction projects. Oxford: Blackwell Publishing. 6. Smith, J. & jaggar, D., (2007). Building Cost Planning for the Design Team.Oxford: Elsevier.